Iyad Burnat is head of the Bil’in Popular Committee and a leader in the village’s non-violent popular resistance movement. Since 2005, citizens of Bil’in have held weekly demonstrations against the building of the Israeli separation wall through the community’s agricultural lands and the encroachment of illegal settlements. The demonstrators are joined by Israeli and international peace activists, and have maintained a commitment to non-violent methods of resistance in spite of armed, military opposition that has resulted in many injuries and some deaths. Iyad was born in Bil’in in September of 1973. He is married and has four children. He became involved in popular resistance as a teenager, and was arrested by the Israeli military for the first time at age 17. He was accused of throwing stones, and imprisoned for two years. Since then he has been arrested and imprisoned by the Israeli military several more times. During his 2012-2013 American tour, Iyad will tell the stories of Bil’in and life in the occupied West Bank, and talk about strategies for non-violent popular resistance with a goal of peace and prosperity for all people. His presentation will be accompanied by photos and videos. Iyad Burnat is a leader of a Palestinian village's popular non-violent protest movement (the Bil'in Popular Committee) against Israeli occupation and illegal land claims and settlement. He is in the midst of a 2-month speaking tour around the U.S., his first trip here. Many of us have met Iyad while visiting the West Bank and experienced his family's gracious hospitality. Iyad is traveling with hand-embroidered goods from his village, and we will have an opportunity to purchase items (just in time for the holidays!) to support Bil'in. A Film on Non-Violent Resistance Against the Israeli Occupation. Winner of the Sundance 2012 World Documentary Directing Award and a NY Times Critics Pick. Followed by a discussion with Iyad Burnat, one of the leaders of the struggle against Israeli Occupation & the building of the apartheid wall in Bil'in, Palestine. Since 2005, residents of Bil’in have held weekly demonstrations against the building of the Israeli separation wall through the community’s agricultural lands, and the steady encroachment of illegal settlements. 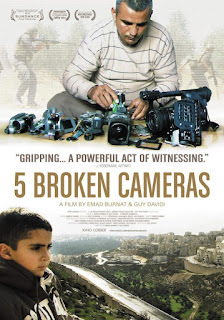 These demonstrations are the subject of the recent award-winning documentary film 5 Broken Cameras, which was made by Iyad’s brother, Emad Burnat. When his fourth son, Gibreel, is born, Emad gets his first camera. For more than five years, Emad films the struggle, which is lead by two of his best friends, alongside filming how Gibreel grows. Very soon it affects his family and his own life. Daily arrests and night raids scare his family; his friends, brothers and him as well are either shot or arrested. One camera after another is shot at or smashed, each camera tells a part of his story. All events are Open to the Public. Limited Seating. Co-Sponsored by: Arab-Jewish Partnership for Peace and Justice in the Middle East, American Friends Service Committee, Chicago Faith Coalition for Middle East Policy and Jewish Voice for Peace-Chicago. Al Aqaba is a Palestinian village in the Jordan Valley, 97% of which is under demolition order because of its location in Israeli-controlled Area C (which covers 62% of the West Bank.) Villages in the Jordan Valley are especially vulnerable to demolitions and water confiscation. Like several Area C villages, Al Aqaba is located between Israeli military training camps. Despite constant threats to the peace, and existence, of their village, Al Aqaba continues to run a council, two schools, a small clinic, a sewing cooperative, a tea factory, a library, and several other internationally-supported initiatives to help the community grow and thrive on its own land. New houses are currently under construction so that families who left can now return. Come learn what you can do to help support the community of Al Aqaba! Morgan Bach is the visitor coordinator for the Al Aqaba Guest House, in the Palestinian village of Al Aqaba (Jordan Valley, West Bank). She found the village because of a campaign to save their kindergarten, which is under demolition order, along with most of the village. After serving two years in AmeriCorps in New Orleans, she spent eight months living in Al Aqaba as a teacher, writer and filmmaker. Now she's touring the US to share her experience and promote building and advocacy projects for Al Aqaba and other at risk communities in Area C, where over 12,000 demolition orders are standing for Palestinian structures. Morgan will be giving a multi-media presentation on her time in Palestine and sharing two projects: the Al Aqaba Guest House, and Rebuilding to Remain. These projects are supported by Palestinians, Israelis and internationals who make up a growing movement for Palestinian equal rights, particularly the right to community planning and building. One of this year's hottest holiday shopping items, SodaStream makes soda in your own kitchen. But did you know that they're made in settlements on stolen Palestinian land? Join us as we ask Macy's to help pop the occupation bubble, and take SodaStream off of their shelves.